3 GLUTEN FREE SNACKS Using Buckwheat in Gluten free diet! Get ready to tango with Peach Mango! One of your favorite flavors of IsaLean™ Shake, Peach Mango, will now have a permanent home in the Isagenix shake lineup! Those of you who remember this summer limited-edition flavor from the past can now enjoy it all year long. This creamy blend of citrus flavors was a smash success during its limited-edition run, and we’re thrilled to give it permanent status and a place in your pantry all year long…But, there’s more! For the Peach Mango IsaLean Shake launch today, we will offer free ground shipping for existing Customers up to US$25/CA$27.77 in the United States, Puerto Rico, and Canada when you add one or more canisters of Peach Mango IsaLean Shake to your order! This promotion is available to qualifying Autoship and wholesale orders only (does not include new Members) and will last until July 29. 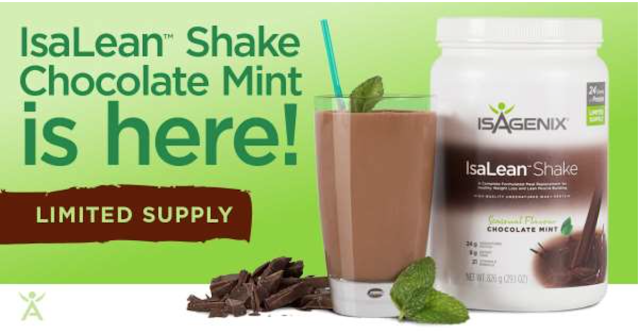 Don’t miss this amazing promotion and delicious flavor of IsaLean Shake to help slim down for summer! Order Peach Mango IsaLean Shake using your IsaLife™ mobile app or visit your Back Office today. *Orders that include Peach Mango IsaLean Shake as part of a pak or system do not qualify for this promotion, Peach Mango must be added as an additional item to an order. Free Isagenix ground shipping (US$25/CA$27.77 value) is automatically applied to qualifying orders that process from July 24, 2018 (12 a.m. EDT) through July 29, 2018 (11:50 a.m. EDT). Orders must process during the promotional period to qualify. Not applicable on new Customer orders. When I started in my own small business I had very little experience in such endeavors. I was in my early 20’s and I was overflowing with ambition. I personified “ignorance on fire!” My goal was simple, to never have to work for another human being ever in my entire life. I wanted to be a Millionaire by the time I was 30 and retire by 40. Sounds good right!? I was a dreamer, you can’t knock that. I was naïve though. My lack of experience set me up for some rough lessons and a harsh reality. I just assumed that a person could open up their doors to their business and then good things would start to happen. This is why many of us businessmen believe that starting your own business might be equally as beneficial as a college education, even if you fail! We certainly do learn more from our failures than from our successes. That first year I was really active researching, creating, promoting, branding, selling products, following up with customers, you know all the things you are supposed to do in business. I achieved some success, although limited in my view and it certainly didn’t stack up anywhere what I saw other people in my industry doing. I remember at one point after that first year, I sat and took inventory of my business and my results. It was a sobering experience. I realized that I would have earned more by working for minimum wage at a local fast food restaurant than what I had earned in my own personal business venture! At the time this was a disheartening experience, I became unmotivated. I found myself in a funk for probably 6 months time and then I snapped out of it with the help of wonderful mentors and training that I came across. Some of this training was centered around a couple of analogies that have really stuck with me even fifteen years later. I love analogies and stories that cause us to thing deep on our own. This is my preferred method of learning. I’ll share these powerful analogies with you know. You see what we do not understand is that there is so much that goes into the building process that we cannot see, below ground. You have to do all of the site planning, zoning, architecture, engineering, excavating, dealing with water drainage. You have to bring all of the utilities, digging large trenches and tying into existing services or bring them from wherever they currently are. Then there is the forms for the footings and foundation, everything that is going to keep that building standing in the event of something like an earthquake, etc. Oh and I failed to mention the process of working with the city, all of the permitting and inspections. They literally inspect every single thing you do and consider the safety, longevity and impact that this building might have on neighboring structures and the environment. Personally I am not a contractor/builder of such structures, so I am probably leaving a lot of things out, in fact I know I am leaving out a lot. Bottom line, everything that must be accomplished below ground can take many months! The phenomenon I previously referred to occurs once the builders are able to get above ground and start throwing up walls etc. Once they make it above ground, things progress at what seems like light speed! I have personally come upon a completed home in my neighborhood and remarked to Crystal, “Where the heck did that home come from?? ?” The same goes for a hotel, once they get above ground, they are able to dramatically accelerate their progress as you witness floor after floor going up relatively quickly. It feels like you could practically sit there and watch the building go up in real time in a matter of days. 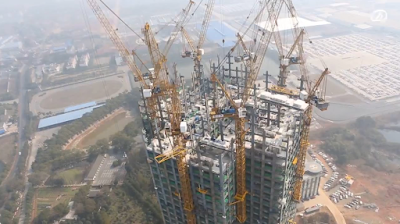 You truly can, as seen in this breathtaking video of a 57 floor sky scraper going up in only 19 days! 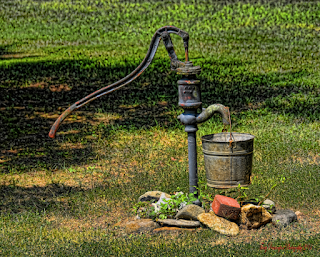 Another analogy that really hit home for me was the concept of an old water pump, like what you would find on an old farm. These pumps have handles attached to them so that you can pump the water up from its source. 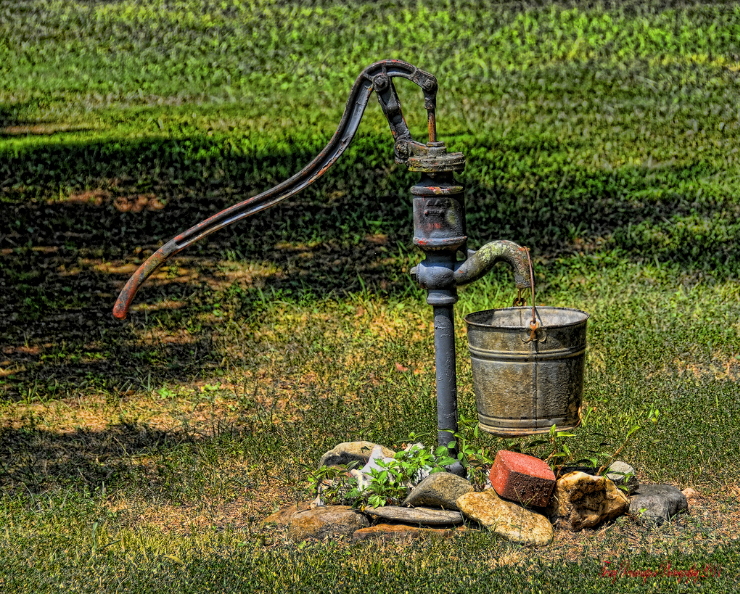 The trick to these old pumps is that the water does not flow immediately. You have to prime the pump with extensive pumping to build pressure like a vacuum in order to get that water to effectively defy gravity and make its way up to you. If you didn’t know any better you might even pump the handle 10 times or so and then stop, assuming that it was broken. In order to get that initial flow, you must pump persistently for what might feel like several minutes. In reality, it probably only takes about 30 seconds or so, but if you are pumping fast, it does feel like an awful lot of work. Even when the water does arrive, it does not do so in great abundance. 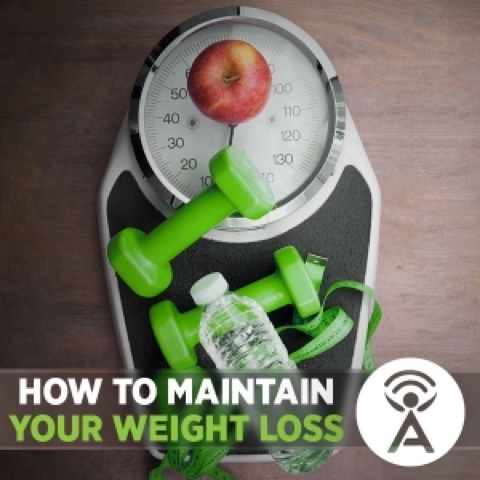 It will start as a small stream and once as before, steady consistent pumping is required to gradually build a steady flow with substantive volume. Certainly not what we are used to in the modern age where we simply turn a knob and have instant water at our disposal! These analogies apply to most any endeavor that we might embark upon. Should we have an unreasonable expectation, like I did for my business early on, we will ultimately find ourselves frustrated and defeated. If we only had the proper perspective, we would know that anything worthwhile takes time to build. Like a beautiful building, anything that is going to stand the test of time and the elements, will naturally take time to build. It is an investment of sorts. The investment of time below ground as we build a structure, yields a return of accelerated growth once above ground. The time needed to achieve such results can vary depending on the landscape, environment and the experience of the builder. The same can be said about the water pump. The investment of time, pumping away repeatedly in a rapid manner, will yield a return in the form of a steady flow of water. There are things that I like in particular about both analogies. I like that in the building example, you only have to build it once. If done right it will yield a benefit for many years to come, most likely 100’s of years. I would like to mention that even once the building is complete, routine care, maintenance, and updating is critical to ensure longevity. Think deeply about all of the parallels you can find here for your business. I know people who build their businesses fast, got their income up, but because they did not build a solid, sturdy foundation, their success is not self-sustaining. I know people who thought that once the water arrived, that it would naturally just keep coming on it’s own forever without a care. They pay a big price when that water dries up and they have to start all over, seemingly from scratch to get that business going again. Should you remain patient and steadfast in your good business practices, committed to the ultimate vision and mission, you will eventually realize sustained success. When you do, I highly encourage that you never take your finger of the pulse of your business/organization. You may not ever have to work so hard again as you did in the beginning. Let’s hope you did it right, so that you won’t. I wish I could say that I did it out of just a desire to help people. I feel so lucky? I feel so fortunate. Let me share a story with you. I was 22 years old and I had just gone through a divorce. I was in a bad way, didn't really want to associate with people right then. Anyways, I wasn't making much money in my Isagenix business and at that moment in time could not see that as being my "thing" moving forward. I had to do something with my time and so I remember I offered to straighten out my dad's yard, his garage's, shed's etc. I can't remember for sure, but I think I was alone there in the yard for a week or so and I really cleaned that place up well, organized everything, got rid of a bunch of unneeded stuff etc. Then it was like, "ok now what?" It was not rewarding work. It was boring, time crawled. It was ok $ for me at the time, but there was no future there. I remember feeling the same way when I worked construction when I was 17 and 18. Good money, really hard on my body, just exhaustive hard labor with very little reward or future. It would not cause me to grow, other than getting into great shape, which I was in great shape, but I think that was so hard on the body, that it was unhealthy. I remember looking at my hands at times and thinking, my hands are always so sore and achy. My entire body ached. I have made a habit of really analyzing what people do for a living. I wonder if they fill fulfilled. I wonder if they just followed someone else's direction. Did they just happen upon something, or was it really a calculated decision? What would they do if $$$ was not a requirement to live on? My mom was a waitress when I was 10 years old. I know that she made the most of it and did the absolute best job that she could. Our family really needed the extra $ at the time. I know that she made decent money and was probably the most beloved waitress there ever was at Toucan Cantina in Holladay. But she was not destined to remain there. She has always had bigger dreams and vision. Crystal and I have had experienced major life transition recently. It is interesting to observe how much people are conditioned to adopt lables for themselves and then to identify by those labels and live within them. It becomes their identity. I am not sure if this is a healthy thing or not. Just an observation. I wonder if Labels can inhibit us. I would think that putting limiting labels on ourselves could prevent us from reaching our full potential or from even trying to aspire to it. I was taught from a very young age that I should always find a way to work for myself. I have a self admitted personality trait, that I think probably would have prevented me from working for anyone anyways. I hated school. Mainly because the majority of the time I felt they were teaching me things that would not apply to my life or help me live a good quality of life. It is funny, because I see a lot of myself in my daughter Lily. She constantly asks, "Why are they teaching us that!? How is that going to help us? Why would we ever need to know that!?" Deja vu! She also resents being constantly told what to do, all of the time. My brother tried to make me go to college, he had good intentions. He said, "dad is willing to pay for it, shame on you if you don't take advantage of that, many people would be so grateful to have the same privilege." He was right for sure. Still I couldn't force myself to do it. I dropped out after 1 class. Couldn't do it. Felt like I was being drug back into highschool with rigid structure and authority over me. I had lived on my own for a couple years and deep down I just desired to have that liberty to own my own life. There is no better feeling than owning your own time. Owning your own life. I cannot put a price on that. Sure there are challenges to being independent. However it is all I know and all I have really ever done for the last 20 years. I love Entrepreneurship. I love taking risks. I love investing. I love being creative and open to all kinds of wonderful opportunities. I believe that although we are not all born on this earth with equal opportunity, and we are not, I don't care what anyone says about that. For example, I was born in America, the land of the free. I was born to parents who taught me the value of hard work and did everything they could to provide a good quality of life for me. I was never without food or shelter, although there were a couple of times where things did get tight. Still, I was better off than probably 90% of Americans. Most people that are not raised in self employment, do not pursue it or even have an interest in it. Human beings are copy cats. Most people do what their parents did. We often subscribe to the same line of work, politics, religion, financial views, etc as our parents did. That is a given. I have not had to have nearly the amount of courage in my life as say my dad or my mom did. In many ways I have just followed there footsteps. Did I have a choice? Sure. Mine was more of a conscious choice though, rather than just tagging along. I give them credit for 30 plus years of entrepreneurship before they found the Golden Goose "Isagenix." They tried 31 different types of ventures during that time that. That was only what I could remember. There was probably more. Most people do not live their life like that! I once heard "that a smart person learns from their own mistakes, however a truly wise person learns from the mistakes of others." When I decided to immerse myself in Isagenix as a career path, it was not a matter of me just doing what was available or natural. I had many options available to me. I looked at the kind of lifestyle that I desired and made a conscious decision to invest in the vehicle of network marketing to acquire those things I most desired. It was a business and a money decision. I wish I could say that I did it out of just a desire to help people. That would not be authentic. That would not be true. My shallow motivation at the time was, how do I invest the least amount of time (in years) and yield the highest return that will benefit my life and that of my family. That is how I ended up in Network Marketing. How do I beat the rat race? How do I get ahead? How do I leverage what skills, talents and gifts I had to make my dreams come true. Based on the experience of my parents, I knew there was not another place outside of network marketing that could provide me with such leverage. There isn't. Where I got lucky. Yea we've made the $. I've always enjoyed making money, I don't deny that and see nothing wrong with it. I am so grateful, I have to have it, gotta pay those bills, gotta feed those mouths, want to enjoy life and all the perks, entertainment etc. What has been the added bonus is I have discovered that what many older/wiser people always said from the stage is so true. You do make meaningful, lifelong friends with people that are the best kinds of people on earth. We do get to transform people's health and help them rediscover their passion for their lives and their relationships. We help people evolve into a greater version of themselves. Personal development and self education is at the forefront of everything we do. You really just thought we hawked a product to people? You are sorely mistaken. You may not understand our deeper mission or purpose. Well, I could keep going on and on, but the bottom line is how grateful I am to do what I do. To have that privilege. Not everyone has that. I so wish that everyone did. Everyone deserves to live life on their own terms. 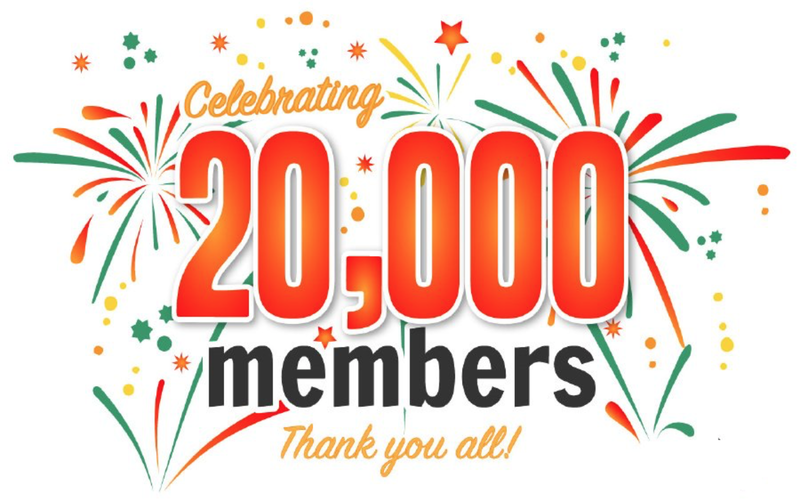 Celebrating 20,000 Member of our Facebook Nutritional Support Group! We did it everyone! 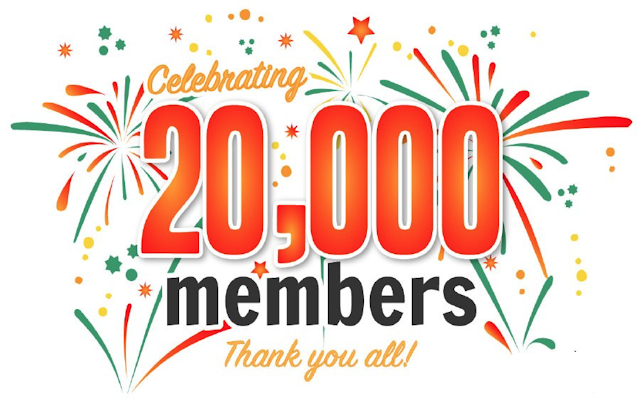 20,000 thousand members in our private facebook group is now a reality! Congratulations to 20k everyone, this represents thousands of lives transformed! Please do post all of your "Cheers to 20k" videos and pictures in the group. Thank you to all of you who participate in this amazing group and make it what it is. Cookies & Cream IsaLean Shake contains a delectable fusion of flavors from crunchy chocolate cookie bits atop rich, creamy vanilla goodness. This refreshing shake is the perfect partner to help you crush your transformation goals! Our anniversary seasonal IsaLean™ Shake flavor, Cookies & Cream, is now available for purchase in the U.S., Canada, and Puerto Rico once again! January Jolt! Did you hear? Leaders, here are the recordings from yesterday’s Jump-Start Your January Jolt Zoom call! Time to Grow! Have to be Crazy not to take advantage of these generous incentives! Cookies And Cream Isalean Shake is Back Tuesday Dec.5! *SUGGESTION- Get online first thing tomorrow morning and order extra. Once they are gone they are gone for a long time. First come first serve+Limited Supply=Isagenix Feeding Frenzy! Cookies & Cream seasonal IsaLean™ Shake is now available for purchase in the U.S., Canada, and Puerto Rico once again! Cookies & Cream IsaLean Shake contains a delectable fusion of flavors from crunchy chocolate cookie bits atop rich, creamy vanilla goodness. This refreshing sghake will be available in the U.S., Canada, and Puerto Rico starting Dec. 5! Be on the lookout for more details on all things Cookies & Cream at IsaFYI.com. A superior branched-chain amino acid profile. 24 grams of high-quality undenatured whey protein. Active enzymes to ease digestion. This Customer favorite will be available for US$39.95/27 BV* and will be available for purchase in Canada for CA$44.95/27 BV* while supplies last. You may even want to get a head start on your holiday shopping while you’re there…Do not delay! And don’t forget to share this exciting flavor with your teams! *Associate and Preferred Customer pricing. **Due to limited supply, a maximum of 20 canisters may be purchased per order. Keep in mind, canisters can only be purchased as an individual wholesale item. Orders will be shipped based on inventory; this product is not available to add to your monthly Autoship or as an option when building an Isagenix System. FREE MEMBERSHIP AND FREE SHIPPING FOR NEW MEMBERS WHO ENROLL WITH A 30 DAY! TOMORROW ONLY, So text all your friends who are fence sitters and let them know that this is the biggest promo the company has offered in 15 years and that is the absolute truth. Let's all make sure our friends plan ahead and get their stuff ordered tomorrow in preparation for the new year! This represents $50 in savings for new customers! The free shipping is automatically applies and the free membership code is "Free21"
Here is an example of a text message I am personally sending my fence sitters. I already got a text back from one saying, "call me tomorrow, let's do it!" "Stuart. Hey I gotta make you aware of this only because in 15 years with Isagenix they have never offered this much of a discount. 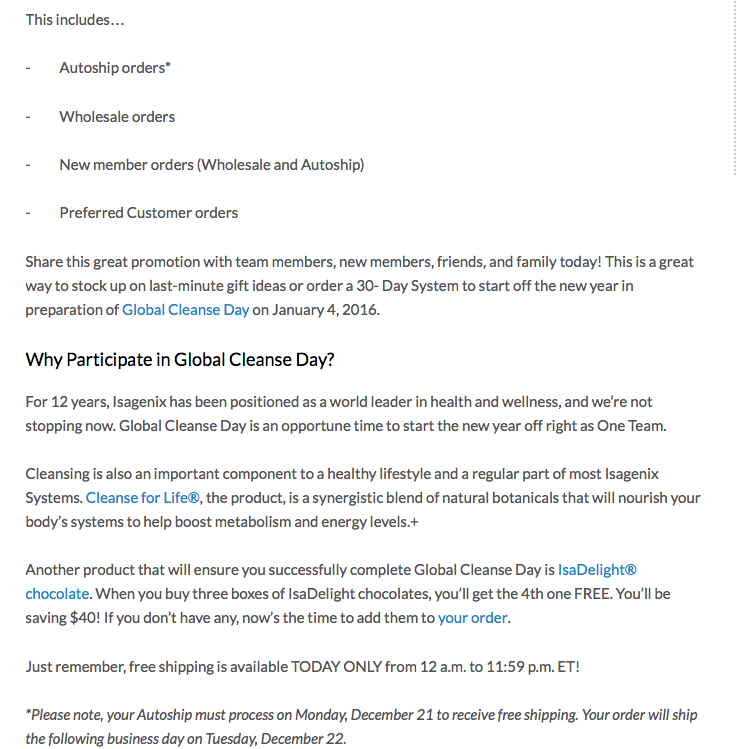 They are offering tomorrow a one day promo where if someone gets a 30 day system, their membership is free and their shipping is also free. That is $50 in savings right there. So I just had to pass this on to you because I know you have expressed interest. Ok let me know. Thanks! Sean"
Special 2 day Free Shipping Offer! Tomorrow and The Next! With 2017 New Year Kick Off just around the corner, the excitement has reached fever pitch here at Isagenix World Headquarters, and we want you to feel it, too! To help you get pumped and ready for an amazing new year of transformation, we’re announcing a special free* shipping offer that starts tomorrow for both new and existing Isagenix Customers! For just two days – December 20 and 21, 2016 – Isagenix is offering free* ground shipping on any single order of 125 BV or more (up to a US/CA$25 value). This offer applies to both wholesale and Autoship orders placed, and Autoship orders processed between 12:01 a.m. ET Tuesday, December 20, and 11:59 p.m. ET Wednesday, December 21. IMPORTANT: You must change your processing date at least one day before you want it to process to either December 20 or 21 by selecting the “Manage Autoship” button. Due to processing time frames, you are not able to change your Autoship to the current day’s date. Keep in mind that, with the holiday season in full swing, shipping times may run longer than usual. Please allow additional time for your order to arrive. You can track the status of your order by logging in to your Back Office and selecting “View Orders” to view your order invoice and tracking information. Please share this unique savings opportunity with your team. All North American Associates will receive an email announcement, but with the holidays upon us and everyone busy with last-minute preparations, we are counting on leaders like you to do what you do best and help spread the word. Be sure to look for the complete announcement and shareable details at IsaFYI.com and the official Isagenix Business Facebook page. *Free Isagenix ground shipping (US/CA$25 value) is automatically applied to only one qualifying wholesale order per customer placed from December 20, 2016 (12:01 a.m. ET), to December 21, 2016 (11:59 p.m. ET). 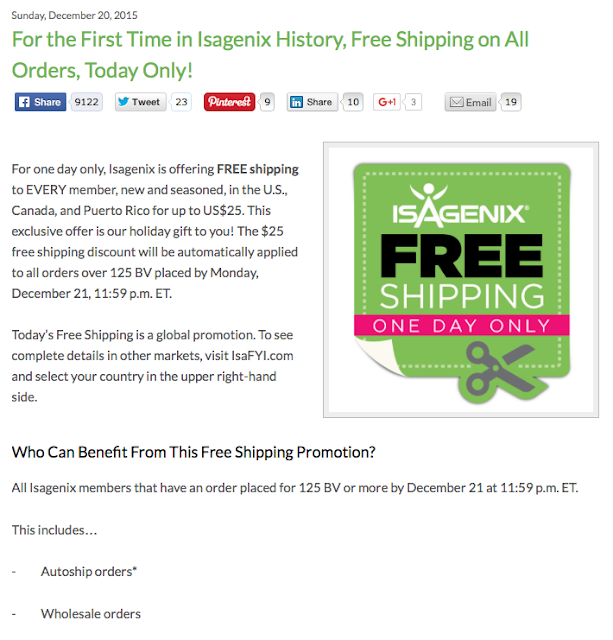 Free shipping applies to Isagenix Autoship orders processed on December 20 and 21, 2016. Orders that are processed before December 20, 2016, or after December 21, 2016, will not qualify for free shipping. To qualify in the United States, Canada, or Puerto Rico, a product order of 125 BV or more must be placed by a new or current Isagenix Customer (wholesale and Autoship orders may qualify). For the purpose of the promotion, “Customers” are defined as Associates and Preferred Customers. Take Courage Partner. 2017 is almost Here! I shared this recently with one of our Mexico leaders and I think you will relate. This time of year can get frustrating. I do not wish to say we have to buy into the "Holiday" way of thinking. Certainly people can keep growing. At the same time, I am a realist and I know that some of you have seen your business slow a bit and you are worried. Please read this for me and take courage partner! 2017 is in sight and you will instantly regain your passion and your momentum. Rest up a bit. No shame in it. Come January 1 we will hit this thing harder than we ever have before. Before us lies new horizons, big bright futures and lots and lots of success. You should start to feel it in your heart. In your bones. It's coming. You should anxiously await for January 1st just as you did for Christmas Day as a child! It is coming!!!! I Often tell my people that the business comes in seasons. A season for planting. A season for nurturing and weeding and then a season of Plenty and harvest. Such is the flow. And we learn that we must stay consistent even in the slower months. The work we do today will not necessarily pay us today or even tomorrow. We do not trade time for money in Isagenix and so the reward is not immediate. We learn that anything worthwhile takes investment and time to build. The work we put in this week will probably bare fruit 3-4 weeks down the road. For people that do not understand this concept, and who are used to immediate gratification, this can be very discouraging and even defeating. It is the same with consultants. You have 10 active and then 7 and then all of the sudden 4 and you think oh no what am I doing wrong!!? I can promise you that you are not doing anything wrong. It is those people who dropped off who are not motivated. And so you cannot resurrect the dead often times, it is easier to give birth than to perform that miracle! So we go and find new more legitimate ones in time. Ones that will stick. Héctor and I had a great conversation over lunch and he shared that with one person he might give everything he has to support them, all of his time, resources and energy. And yet little comes of that person. Whereas to another he might give very little and yet they still of their own fruition go out and make amazing things happen! This has been my experience as well. We cannot do this for people. We cannot want it more for them than they do for themselves. Those who are ready to run will run. We just point the way and in some cases we have to even get out of their way!!! In other cases like with Clau, they show us the way! Clau said to Me once, "I want you to mentor me." I responded, "I actually think you can mentor me!" The business also comes in waves much like the ocean. A small week followed by a larger one. Then small, small, small and then "wow!" A big one! It's those big ones that naturally keep us coming back. 😁. We realize that the leverage is working and the rewards are there. Imagine one day, your weak week could be 10 cycles. And even beyond that you could have a slow week of 100 cycles in a week. I have realized this myself as have so many others. A slow week for me would be to drop below the 250 threshold. You are doing great. Each of you! Keep learning and growing. Nothing pays like Isagenix. Chocolate Mint is BACK tomorrow by Popular Demand! Tomorrow Mint Chocolate is back for limited time! Back by popular demand... Isalean in Mint Chocolate. Order while supplies last, and they sell out quickly! 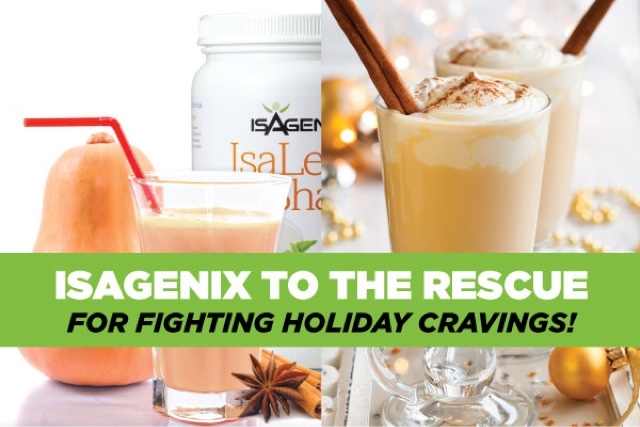 Login you Isagenix Account, and click "place order" You cannot purchase special seasonal shakes in your Autoship, only can be purchased by clicking "place order" as a wholesale order. 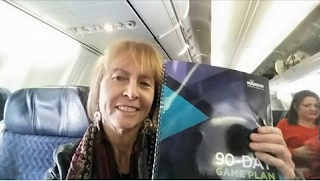 Isagenix 2016 Body Alive Team Holiday Zoom Training! Eggnog Shakes Possibly Available Tomorrow! Heads up! 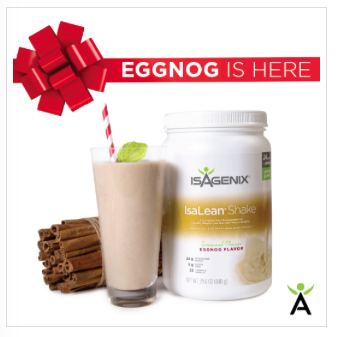 Word on the street is that Isagenix is going to launch their Seasonal Holiday Shake tomorrow, most likely the Eggnog Flavor. If that is the case, then consider yourself notified! We are talking about Tuesday, November 15th. As usual there will be a limited supply and so we recommend you jump into your back office as soon as possible tomorrow so you can get your hands on some. Happy Holidays! 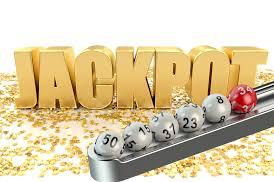 We have our 199th Millionaire today! 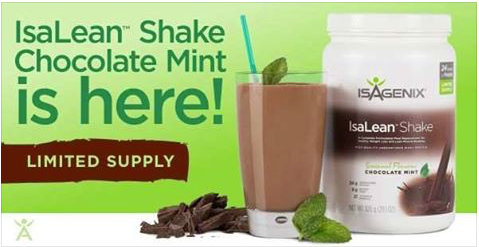 Chocolate Mint Shakes now Available! Will sell out within a matter of days. Order by placing a wholesale order in your back office. Locate under New Products. Spice Up Fall With Pumpkin Spice IsaLean Shake! It’s back! Pumpkin Spice IsaLean® Shake has returned for fall and will be available for purchase today, September 13, for a limited time! Spice up your daily routine with this 240-calorie meal replacement—a creamy blend of pumpkin, cinnamon, and nutmeg. As with all of our seasonal shakes, Pumpkin Spice IsaLean Shake is only available in canisters and for individual wholesale orders. Each canister is US$39.95/27 BV and CA$44.95/27 BV. Don’t wait to place your orders as supplies are limited. Please note, in an effort to allow as many customers as possible the opportunity to enjoy fall’s favorite flavor, there is a maximum of five canisters per order. Orange Cream Isalean! I like the sound of that! All of my IsaPeeps. 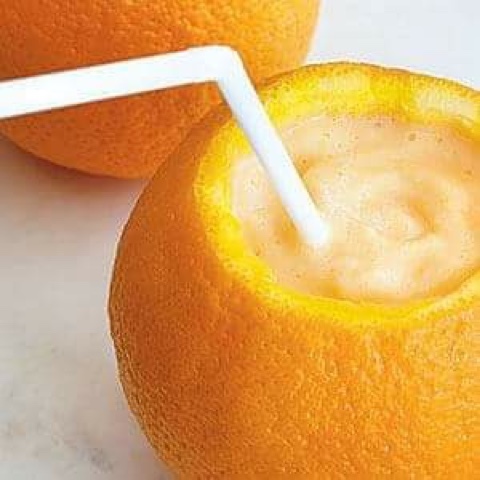 Seasonal Flavor Orange Cream IsaLean shake is available today and will likely sell out quickly! Available in your back office as a wholesale order only. We got ours ordered up this morn! Happy 14th Birthday Isagenix! A wonderful offer for you. Tomorrow, March 23, 2016, we are celebrating 14 wonderful years of passion, contribution, fun, and health as an Isagenix family. That is 14 years of dedicating ourselves to helping others develop and maintain healthy lifestyles and growing one of the largest health and wellness companies in the world! To help celebrate our birthday and thank all of our hardworking Associates for 14 incredible years, we are offering 2016 Celebration tickets for $114 for 14 days! That means from Wednesday, March 23, 2016 to Wednesday, April 6, 2016, you can secure your tickets to 2016 "One Team" Celebration in Las Vegas for only $114! Events are crucial to building team unity, renewing belief in the products and company, and learning and growing as a leader and business builder. As an Isagenix leader, you know Celebration is our flagship event and how powerful and impactful the one-of-a-kind experience is for all Associates in attendance. Plus, with the purchase of every (1) Celebration ticket, you have the opportunity to register for (1) admission pass to the Celebration After-Party with Maroon 5! You do not want to miss it! Now you and your team members have a chance to take advantage of this great offer. Be a part of all the excitement and fun at Celebration for only $114! 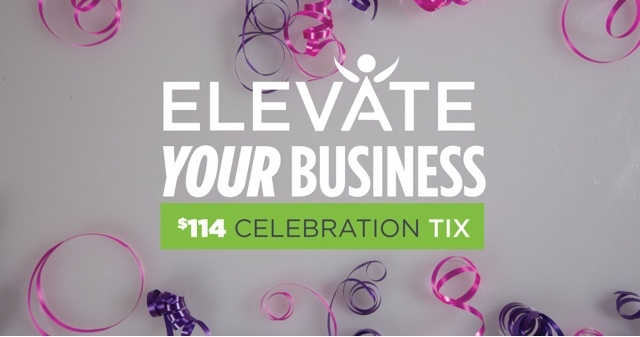 To purchase your Celebration ticket or buy them for your team members at the special price of $114, head over to IsagenixCelebration.com! Thank you for all you do, and cheers to 14 great years as an Isagenix family! About this Crystal Reset. Team, this Crystal Reset is nothing more than what you make of it. In life, we often feel a tug or a pull to do this or to do that. What the company has offered us, it is unfathomable from my perspective. That's because when I joined Isagenix there was no bonuses, just cycles. There was no RAB's. The PIB was $10.00. There was no 5 cycle bonus, no Double Bonuses, no 1 star bonus, Crystal Bonus etc. No bonus for making consultant and no bonus for creating consultants. Man, am i starting to sound like a grandpa yet? "in my day we walked 10 miles to school in the snow....uphill." lol Seriously can you see things from my perspective? We didn't have any tools. We didn't have any videos or good websites. We had our stories. This company was build on stories told, period! Those stories were told over and over and over again, until your throat got sore and your jaw ached from talking all day long! I used to brag that I only had to work "half days," 12 hours that is. This company is really smart because they continue to give more, as they see the growth in return. Man I wished the government operated that way! Now I want to ask you a question. WILL YOU GO CRYSTAL EXECUTIVE AND EVERYTHING ON THE WAY? Your honest answer to that question is what will determine your result. If you say, "well I am going to try." Then don't bother to even set the goal. If you say, "as long as this happens or as long as that doesn't happen..." That is not commitment. Isagenix just made it easier than ever to achieve these ranks, as they gave each of us an additional 30 days to "experience the products" before we even build. What!? But I will not say it is going to be EASY. I won't lie to you. It will be hard. Maybe the hardest thing you have ever done. What is the alternative though? How many goals have you set and then failed to achieve? I hope that has not become your norm. I say, don't set the goal, don't make the commitment unless you are going to move heaven and earth to see it through. Don't build a team, unless you are going to be committed to that team through thick and thin and continue to lead them and work with them. So with all of that said, I think we have now qualified those who "want to" and those who "need to" from those who "will." There has never been a better time to get out there an share your story and transform lives. It starts every single day that you get up in the morning. You must start every day as if it was on purpose. What is your knee jerk reaction, what is at the forefront of your mind? Where is your passion, is it overflowing and contagious? We can teach and train a lot of things, but ambition cannot be taught friends. You wither muster it up yourself, or you don't. I say, why not? Why not do it? You are here because you want to do it. You are here because you need to do it. Why not just DO IT and GET IT DONE! You'll be so glad that you did. I can promise you from personal experience that you will be so overjoyed that you took the challenge and then willed it to happen. I and so many others in this team are here to support you along the way. Dr. Corey Cameron is leading the charge! 90 Day GamePlan Starts Monday! For those of you who did not make it to NYKO, my prayer for you is that you make it to the next one. As always, it was a phenomenal event. Our company is growing rapidly and we have an amazing new line of Amped products to offer our athletes and weekend warriors. We have also been gifted another crystal reset! This one is even more amazing. The reset began on January 11. We now have 60 days (instead of 30) to achieve the rank of manager, 120 days (instead of 90) to achieve the rank of director and 6 months to achieve the rank of executive. It's like a mulligan in golf! We all get to start over and earn those bonuses! AND our 90 day game plan is on again! It's actually never off! When we are truly engaged in our business, we are always on some kind of plan whether it's daily, weekly or in chunks like 90 days. The beauty of a company wide 90 day plan is we get to help each other stay focused. During this 90 days, let's remember the law of attraction - Whatever we consistently hold in our consciousness we will attract in our lives. As we work to grow our isagenix family, let us always remember our WHY and remember to understand the WHY of those we are attracting. I am so proud of our Isa family. We are a team of leaders and visionaries. We each have our own way of guiding and inspiring those we attract. As visionaries we provide direction. As leaders we have a vision for where we are going, who we are looking for and what we are looking for. We know that not everyone will be on the same page. As leaders, it is our job to find out what their vision is, what they want, their why. Do they want better health? Pay for products? Help with paying bills? Replacement of income? As leaders and visionaries, we help people find their own vision and guide them on the way to reach their dreams. As leaders we get to help our team by reminding them of their goals and dreams. We are encouragers and connectors and we can help by letting our team know that continued hard work leads to the great results they are looking for. Always remember, this is not about us, but about all the people whose lives are transforming because of this opportunity for transforming their health and wealth. Our company has designed a beautiful map to follow, our 90 day game plan. If you were not at NYKO, there is a copy you can download in the back office. Have a HUGE vision for the next 90 days, share your vision, engage with team members and let's explode this business in 2016! I'll see you all at the top! FREE SHIPPING TODAY ONLY! 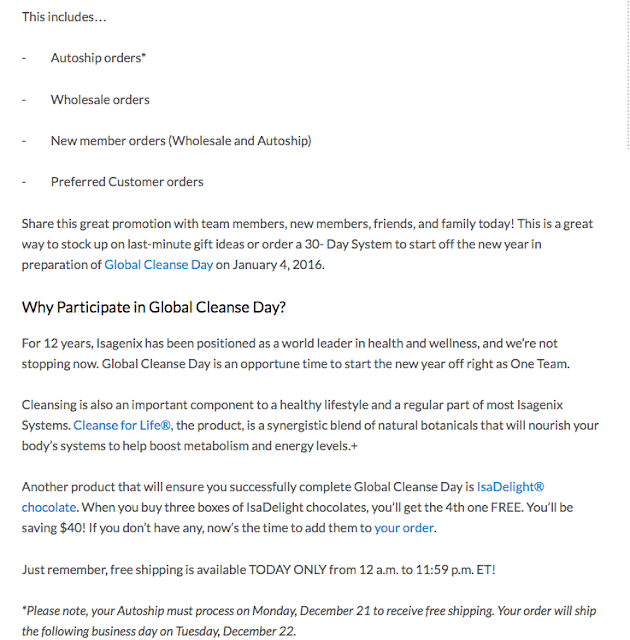 GET YOUR NEW YEAR CLEANSE ORDER IN AND SAVE UP TO $25! Copyright 2010, The Escobar Group. Simple theme. Powered by Blogger.